Dynamic reversible Twin XL bedding will add versatility to your college decor! Looking for Just Peachy Cotton Comforter in size Queen or King? A designer Twin extra long comforter can add the perfect style to your dorm bed and college decor while also upgrading the coziness of your comfy Twin XL bedding. And if you want the perfect designer college comforter that has a simplistic style and beautiful color, our Just Peachy - Twin XL Comforter - 100% Cotton Bedding is a great choice for your dorm room! This one of a kind dorm comforter is pretty as a peach, and is sure to enhance the look of your dorm decor when you add it to your extra long Twin bed. 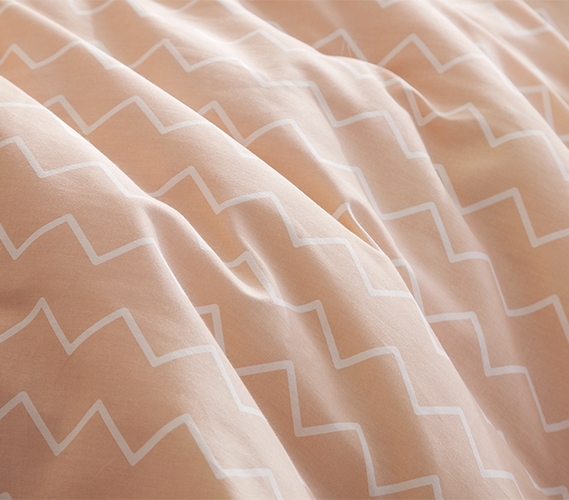 The lovely peach color on the front side of this designer Twin XL comforter is broken up by a white zig zag pattern and has a reverse white and black grid pattern. The unique style of this beautiful college comforter will make your dorm bed the center of attention when it comes to college decor. And since you'll need your beauty rest to face your busy schedule every day, we know that your Twin XL bedding essentials also need to be comfortable. Luckily, this designer dorm comforter is more than just a pretty face. Made with soft to the touch cotton on both the oversized Twin XL comforter and the matching standard pillow sham, the comfy feeling of this college bedding set will give you comfy Twin XL bedding that will help you relax at the end of a long day. Made with machine washable materials, this extra long Twin bedding essential is a great choice to add to your college dorm room.